The term Hanmille is a portmanteau formed from the word “Han” and “Simille.” Han is from “Hanyang” and Simille is from the Korean words “si-mil-le” which can be translated into “a firm or everlasting friendship”. Approximately 4,000 foreign students are currently studying at Hanyang University. In order to provide them with support to help them better adjust to life in Korea, the Office of International Cooperation (OIC) is operating a program called Hanmille. It started in the Fall semester of 2007 and has been praised by everyone involved. In this program, a Korean student is paired with a non-Korean counterpart to form a relationship consisting of mentor and mentee, respectively. 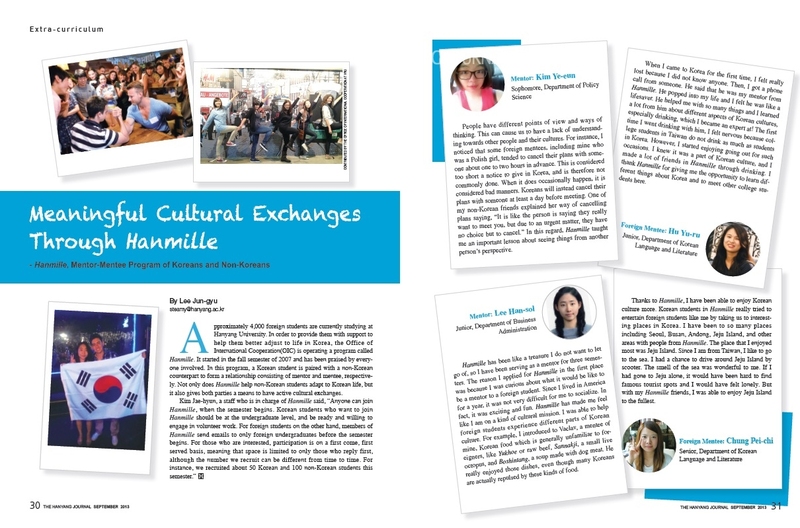 Not only does Hanmille help non-Korean students adapt to Korean life, but it also gives both parties a means to have active cultural exchanges. People have different points of view and ways of thinking. In Korea however, one thing that we all have in common is our behavior based on shared culture. But this can cause us to have a lack of understanding towards other people and their cultures. In this regard, Hanmille taught me an important lesson. For instance, I noticed that some foreign mentees, including mine who was a Polish girl, tended to cancel their plans with someone about one to two hours in advance. This is considered too short a notice to give in Korea, and is therefore not commonly done. When it does occasionally happen, it is considered bad manners. Koreans will instead cancel their plans with someone at least a day before meeting. Doing so much more in advance is considered good manners for Koreans. One of my non-Korean friends explained her way of cancelling plans saying, “It is like the person is saying they really want to meet you, but due to an urgent matter, they have no choice but to cancel.” Hanmille taught me an important lesson about seeing things from another person’s perspective, because some things cannot be understood within a strictly Korean cultural context. This is a valuable lesson that has helped me to better understand others. When I came to Korea for the first time, I felt really lost because I did not know anyone. Then, I got a phone call from someone. He said that he was my mentor from Hanmille. He popped into my life and I felt he was like a lifesaver. He helped me with so many things and I learned a lot from him about different aspects of Korean cultures, especially drinking, which I became an expert at! The first time I went drinking with him, I felt nervous because college students in Taiwan do not drink as much as students in Korea. But, I started enjoying going out for such occasions. I knew it was a part of Korean culture, and I made a lot of friends in Hanmille through drinking. I will soon leave Korea to return to my country. I will miss everyone in Hanmille because I have come to think of them as part of my family in Korea. I thank Hanmille for giving me the opportunity to learn different things about Korea and to meet other college students in here. When I return to Taiwan, I plan to get a job in a Korean company and come hope to come back to Korea. Hanmille has been like a treasure I do not want to let go of, so I have been serving as a mentor for three semesters. The reason I applied for Hanmille in the first place was because I was curious about what it would be like to be a mentor to a foreign student. Since I lived in America for a year, it was not very difficult for me to socialize. In fact, it was exciting and fun. Hanmille has made me feel like I am on a kind of cultural mission. I can help foreign students experience different parts of Korean culture. For example, I introduced to Vaclav, a mentee of mine, Korean food which is generally unfamiliar to foreigners, like Yukhoe or raw beef, Sannakji, a small live octopus, and Boshintang, a soup made with dog meat. He really enjoyed those dishes, even though many Koreans are actually repulsed by these kinds of food. Thanks to Hanmille, I have been able to enjoy Korean culture more. Korean students in Hanmille really tried to entertain foreign students like me by taking us to interesting places in Korea. I have been to so many places including Seoul, Busan, Andong, Jeju Island, and other areas with people from Hanmille. The place that I enjoyed most was Jeju Island. Since I am from Taiwan, I like to go to the sea. I had a chance to drive around Jeju Island by scooter. The smell of the sea was wonderful to me. If I had gone to Jeju alone, it would have been hard to find famous tourist spots and I would have felt lonely. But with my Hanmille friends, I was able to enjoy Jeju Island to the fullest.